Each online workshop consists of bite sized lectures, interviews with event & festival professionals, and quizzes. Plus you have the opportunity to interact with fellow students and your tutor! These are affordable online workshops with quality content! Prices are in US Dollars. All my workshops are hosted on the Thinkific-platform. Hover over the pictures for more information about each workshop. Only $25!! Yes, let that sink in for a moment. 13 hours worth of content, interviews with event industry experts, and 1-to-1 tutorials on request. All of that for only $25. Sign up today and you will learn how to plan, organise, and produce a successful event. Remember, it's only $25. Working as a project manager for the International Centre for Crowd Management & Security Studies I have seen some 'interesting' approaches to health & safety regulations at events and festivals. From incomplete front of stage barriers to overflowing toilets and anything in between. I have worked at an event where an incompetent event management plan lead to audience members being hospitalised. As an event planner you need to avoid these kind of mistakes. After all, you are talking about the health, safety and well-being of your audience. The course Event Safety is for you if you are an (aspiring) event planner, an event manager, or an event organiser. Throughout the workshop you will find exercises to make it practical. And of course you can contact me, your event tutor, if you have any questions. There are 33 bite sized lectures in this course. I have included documents such as the Event Safety Guide and the Guide To Safety At Sports Grounds. This workshop is $15! Yes, you might have to read that twice.... only $15. Because I think a safe event is beneficial for everyone. This is a short course that will teach your the very basics of event safety. 2. Is this event safety workshop only useful if I want to plan a festival? A. It is useful if you want to plan any type of event. The workshop covers a wide variety of subjects and will benefit any event planner. Truth be told though that if you are a wedding planner than this course might not be right for you. You can email me throughout this workshop to get 1-to-1 support. What are you waiting for? Sign up today and you will learn how to plan, organise, and produce a safe event. In the early 2000s I was involved in organising a brand new music festival. Brainstorm sessions, great ideas, the correct permits, acts booked... we were ready. But who were we organising this event for? We didn't have a clear answer to this question and as a result we struggled to find the correct market. I wish I knew back then what I know now. This workshop will help you to identify the purpose of your event and, by doing so, figure out who your audience actually is. In addition to the course material I have also included Social Media For Events (PDF document) that will give you a good overview of what each social media platform can offer. The workshop Event Marketing is for you if you are working in the event and festival industry. If you want to know more about event sponsorship, festival branding, and making social media work for your event than this workshop is a must! Aspiring festival producers should also sign up for this workshop as it will give you a fantastic overview of what event marketing entails. After finishing this workshop you will have a better understanding of event marketing, sponsorship deals, branding your festival and social media marketing. "Jarno was a great university lecturer. Always interested how he could help push students aspirations. 2. Is the Event Marketing workshop only useful if I want to plan a festival? A. It is useful if you want to plan any type of event. The workshop covers a wide variety of subjects and will benefit any event planner. A. I want to make sure the course is accessible to those who dream about organising their first event. I want to teach them what event marketing entails. I do not want my students to be out of pocket. This workshop is $15. Yeah, you read that right...only $15. Me tutoring you + interviews with event industry EXPERTS. Sign up today and you will learn how to plan, organise, and produce a successful event. This workshop is only $15! 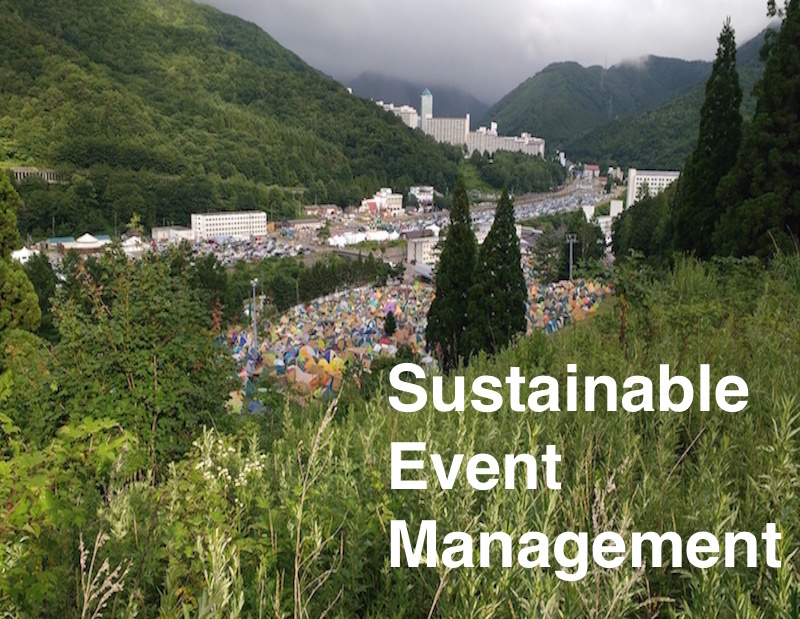 Events and festivals are embracing sustainable event management policies but it remains a daunting task to actually implement these policies. As the coordinator for the Greener Festival Awards in North America I am assessing the environmental plans of event and festival organisations. I will look at their environmental policies, waste management plan, transport plan, biodiversity analyses, and outcome of all these plans. Sustainable Event Management is more than just recycling! In the workshop Sustainable Event Management you will learn what you can do to organise a greener event without it costing you the bank. You will learn the basics of what sustainable development and sustainable event management is. Great news that you want to organise a green event but is your audience actually interested in this? In this section I will discuss the results from my research study at Bonnaroo Music Festival and Lightning in a Bottle Festival. Besides interviews the workshop consist of tutorials, presentations, and reading material. 2. Is Sustainable Event Management only useful when I want to organise a festival? A. It is useful if you want to plan any type of event. The workshop covers a wide variety of subjects and will benefit any event planner. This workshop is applicable to festivals, conferences, meetings, b-to-b events and community events. A. I want to make sure the course is accessible to those who want to make their event more sustainable. Sustainability is about accessibility. Hence this course is only £20. Only $15! Yes, let that sink in for a moment. Lectures, exercises, quizzes, interviews with event industry experts, and 1-to-1 tutorials on request. All of that for only $15. Sign up today and you will learn how to plan, organise, and produce a successful green event. Remember, it's only $15.